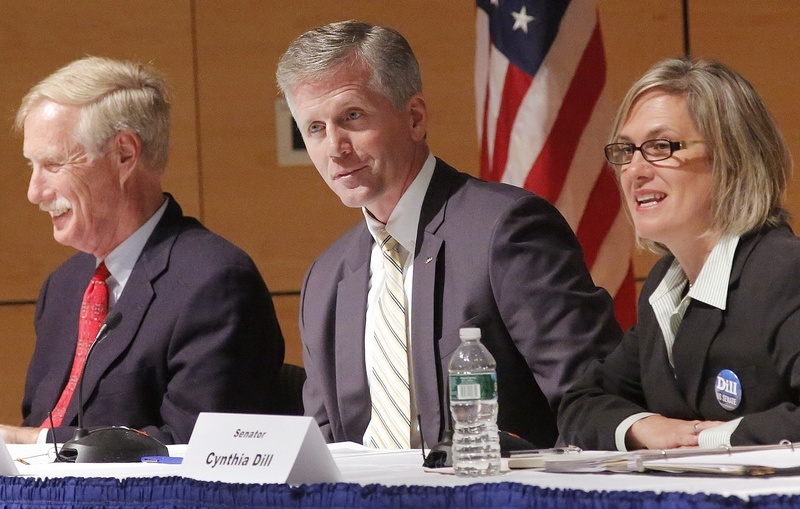 Two of the major candidates for Maine’s open U.S. Senate seat support the Affordable Care Act. The third would repeal it. Democrat Cynthia Dill and independent Angus King back the law, although Dill says she would like to move to a government-sponsored single-payer system. Republican Charlie Summers, meanwhile, says he wants to replace the law with market reforms and increased competition. The Affordable Care Act, also known as Obamacare, is the 2010 law designed to make health insurance available to an estimated 30 million uninsured Americans, including nearly 130,000 Mainers. The law includes incentives and mandates for employers to cover more workers and requires most uninsured adults to buy private coverage starting in 2014. Subsidies will be available to people who cannot afford to buy the insurance, under the law. The law has a variety of other mandates, such as requiring insurance companies to cover pre-existing conditions and prohibit them from cutting off coverage when chronically ill patients exceed lifetime limits on benefits. Republicans in Congress opposed the law, and 26 states, including Maine, challenged the mandatory purchase of insurance as unconstitutional. The U.S. Supreme Court upheld the law in June, setting the stage for a possible repeal vote in Congress after the election. Even if the law survives, the next Congress will be busy with health care reform. On top on the agenda will be rising health care costs and insurance premiums that are straining employers and families. Rising health care costs, together with the overall federal budget deficit, also present a threat to Medicare, the public insurance program for the elderly. Summers, who is Maine’s secretary of state, wants to repeal the Affordable Care Act and says free market competition would improve access to care. “We need to do things to bring the cost of health care down,” he said. Summers says he wants to allow health insurance companies to sell coverage plans across state lines, to let people shop around, create competition and lower costs. The Affordable Care Act allows sales of insurance across state lines, but only if the two states involved agree to minimum coverage standards. Summers supports keeping some parts of the health reform law, including coverage of pre-existing conditions and allowing adult children to stay on their parents’ insurance. He said he supports medical malpractice reform, including limits on awards from lawsuits, which help to drive up health care costs. Summers has said he believes the Affordable Care Act will cost more than it saves, including by shifting about $700 billion out of Medicare provider payments over the next decade. Summers has supported the budget championed by U.S. Rep. Paul Ryan, R-Wis., but said he opposes Ryan’s idea of privatizing Medicare. Dill, a state senator from Cape Elizabeth, supports the Affordable Care Act as a step toward universal access to health care. She ultimately wants the country to move to a single-payer health insurance system, as Medicare is now for seniors. “In my view, we should have Medicare for all. Take the insurance companies right out of the system,” she said at a recent forum. While opponents argue that the private market is more efficient, Dill said a single-payer system would reduce health care costs overall by removing the profit motive and improving primary and preventive care. She also said she favors a move away from “fee-for-service” payments that reward providers for treating illness, sometimes with unnecessary tests or treatment, instead of rewarding them for keeping patients from getting sick. Dill has said she would strengthen Medicare and oppose any cuts to the program. King, a former two-term governor, supports the Affordable Care Act, saying it expands health care access to millions of Americans. Without access to insurance, people often seek treatment in emergency departments that is far more expensive, he said. King has said the focus now must be on reducing health care costs. Reducing costs is especially important for the financial future of the Medicare program, he says. King said he supports experimentation in Maine and elsewhere on new ways to pay for health care. In those tests cases, Medicare is paying physicians set amounts per patient rather than paying only for procedures and treatments. In theory, King said, that rewards providers for keeping people healthy and reduces spending on treatments and procedures.